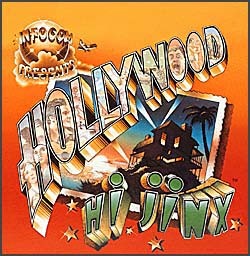 For more information about Infocom, see the files gameinfo.txt and fact-sheet.txt. 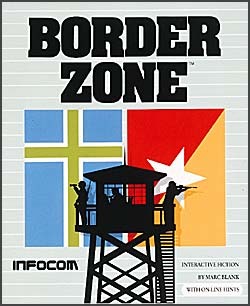 I recently purchased Masterpieces of Infocom, and think it's great. (I knew I would.) 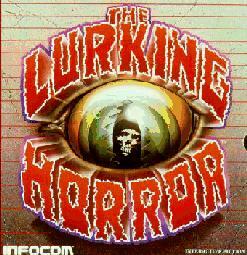 And I thought it was a great gesture when you guys did Zork: The Undiscovered Underground and released it for free. 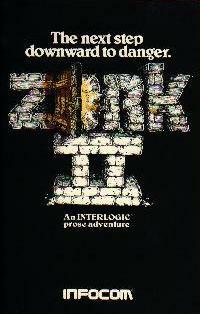 Furthermore I thought it was great that you released the Zork trilogy for free. 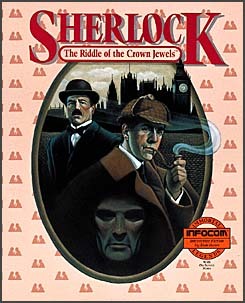 I think it would be utterly fantastic if you would release the other Infocom games for free (unsupported) download. You would be making tens of thousands of people very very happy. I would appreciate it if you would forward this memo to the appropriate people. It probably wouldn't surprise you to know that you are not alone in having these sentiments. While there's no official word on this happening yet, with the lowering prices of these titles, and the increasing pervasiveness of the Internet, none of us would be surprised to see them put those out there. While I can't give you an answer, take heart in knowing that your sentiment has already been conveyed. 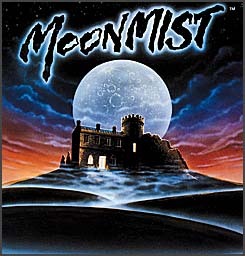 They are or have been distributed by Activision, Inc, Commodore, Softsel and Mastertronic. 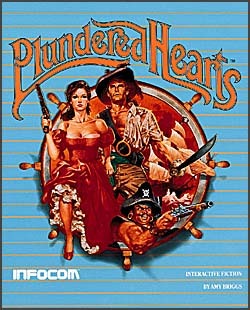 For more information, see Personal Software, Commodore, Legend, Interplay Productions, First Row Software, Accolade, Cascade Mountain Publishing, A. N. A. L. O. G. Computing, LucasArts and Westwood Studios. 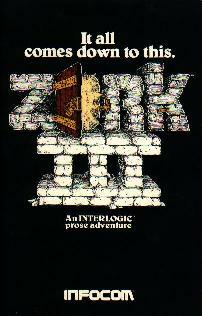 The Zork series of games comes originally from the mainframe Zork. 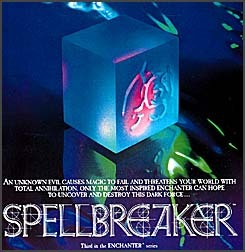 This game was then split up into three parts and converted to a commercial product marketed by Personal Software. 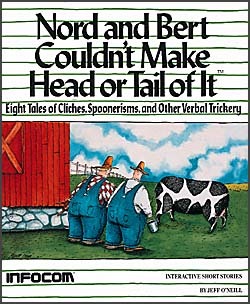 They only got to the first part before Infocom took over and marketed the games themselves, bringing the series up to three games, in total more or less corresponding to the original mainframe Zork. 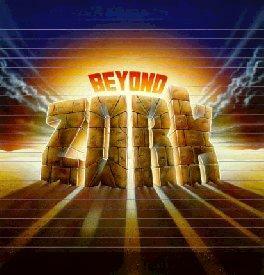 Later, Infocom also released Beyond Zork and Zork Zero set in the same world but adding some new features (on-screen mapping in Beyond Zork, graphics in Zork Zero). 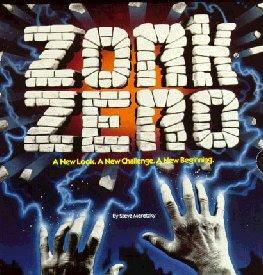 Later, after Activision took over Infocom they began releasing new graphical Zork games. 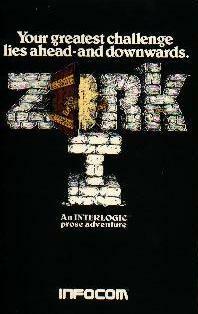 Activision has made the Zork games freely availbale. You can get them here. For more information, see Mainframe adventures. Type: Text only Written 1980 by Marc Blank and Dave Lebling. Type: Text only Written 1981 by Marc Blank and Dave Lebling. Type: Text only Written 1982 by Marc Blank and Dave Lebling. Type: TO (with on-screen map) Written 1987 by Brian Moriarty. Type: Bitmap graphics Written 1988 by Steve Meretzky. Type: Text only Written 1983 by Marc Blank and Dave Lebling. When the wicked power of the Warlock subjugates this land, his magic defenses will recognize all who have attained the Circle of Enchanters. So, to a novice we speak - one yet unproven who has the heart to challenge and the skill to dare. Sealed inside, you will find such wisdom and guidance as we can provide. Stealth, resourcefulness, and courage you must find within yourself. 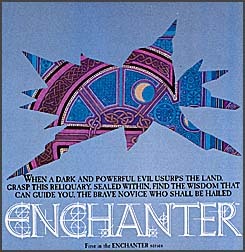 You are the sole hope of this land, young ENCHANTER. Type: Text only Written 1984 by Steve Meretzky. A cryptic diary is all that remains in the sanctum of Belboz the necromancer, grand and powerful leader of the guild of enchanters. It is feared that he is in thrall to evil sorcery. If so, the freedom of the land and the very existence of the circle of enchanters could be forfeit. 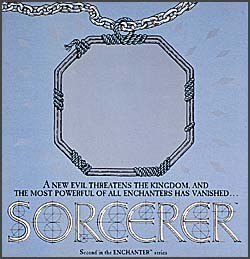 To rescue the kingdom and locate your mentor in the treacherous mists of time, you must gain the powers and cunning of a true SORCERER. 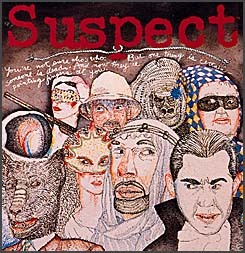 Type: Text only Written 1985 by Dave Lebling. Type: Text only Written 1982 by Marc Blank. 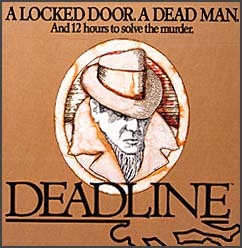 When you take on DEADLINE, you're not just pitting yourself against a 12-hour time limit to solve one of the cleverest and most baffling cases in the detective genre. 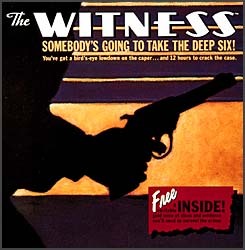 You're encountering a totally original concept in interactive adventure that literally puts the case in your hands. Working from an actual dossier on the crime and piecing together the myriad clues along the train, you face a challenge so sophisticated that your suspects possess independent, flesh-and-blood personalities. And some of those personalities are so treacherous that, should you make the wrong move, one of them may do you in. Type: Text only Written 1982 by Dave Lebling. 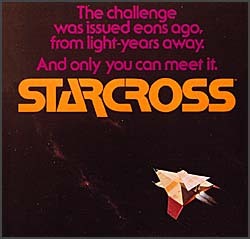 STARCROSS, Infocom's mindbending science fiction first, launches you headlong into the year 2186 and the depths of space. And not without good readon, for you are destined at that point in time to rendezvous with a gargantuan starship from the outer fringes of the galaxy. Upon docking with the strange craft, you must succees in gaining entry to its mysterious interior. 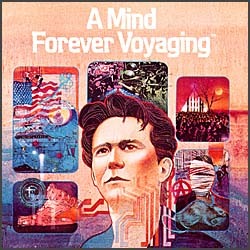 Once within, you will explore as startling, complex and engaging a world as any in Infocom's universe, and come face to face with other-wordly beings, both helpful and harmful. But the great starship serves a far larger purpose than mere cultural exchange. It conveys a challenge that was issued eons ago, from light-years away - and only you can meet it. Type: Text only Written 1983 by Michael Berlyn. They said you would sleep for half a millenium - not an unreasonable length of time, considering you'd be in limited cryogenic suspension. 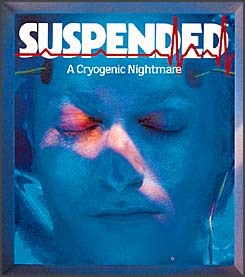 Your body would rest frozen at the planet's nerve center, an underground complex twenty miles beneath the surface. Your brain, they told you, would be wired to a network of computers; your mind would continue to operate at a minimal level, overseeing maintenance of surface-side equilibrium. And you would not awake, so they promised, until your five hundred years had elapsed - barring, of course, the most dire emergency. In SUSPENDED, you will strategivally manipulate six robots. 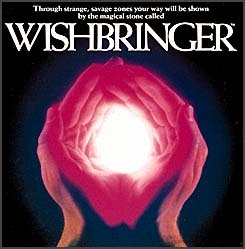 Each has a distinct perception of the world, and offers you specific abilities. For instance, one specializes in sight, a second in hearing, and a third in accessing information from computer memory banks. Through them, you will solve an intertwined myriad of realistic and original problems. Should you find yourself baffled by some of the more intricate puzzles, you may wish to consult the underground complex's built-in advisory peripheral for hints. The first time you play SUSPENDED will not be your last. It continually challenges you to hone your strategies and develop new ones, to explore new areas and interactions, and in so doing to improve your score each time you play. And even if you succeed in mastering the first level of play, an advanced second level waits in the program to test your mettle again and yet again. In fact, the game is so designed that you can alter conditions at will before starting, effectively allowing you to customize the game into a new kind of SUSPENDED whenever you desire. Type: Text only Written 1983 by Stu Galley. Dead: one gilt-edged society dame. And now it looks like some two-bit grifter is putting the screws to her multi-millionaire old man. All in all, a pretty typical Angeleno clan for these days. But then the shakedown turns ugly, and you're left with a stiff and a race against the clock to nail your suspect ... if, that is, you don't cash in your chips ahead of time! February, 1938. FDR's New Deal is finally rolling. Hitler's rolling too; this time, through Austria. 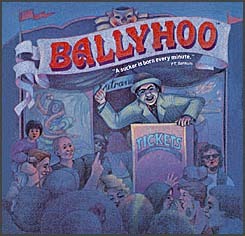 But as Chief Police Detective for a quiet burgh on the outskirts of L. A., you've got other fish to fry. Working from a clue-laden police file and battling a 12-hour time limit, you're up against your toughest case to date: a sordid family affair that may land everyone from the knockout heiress to the pokerfaced Oriental butler in the slammer before it's over. Ahead of you is a Gordian knot of motives and alibis to untangle, and the only testimony you can trust is that of your own eyes - because you are The WITNESS. Type: Text only Written 1983 by Steve Meretzky. "Join the Patrol, and see that Galaxy!" You'd taken the poster's advice, bait and all, and marched right over to the recruitment station near your home on one of Gallium's backwater moons. A youth's dream of exotic worlds, strange and colorful aliens, and Deep Space heroics, had danced in your head as you signed the dotted line. 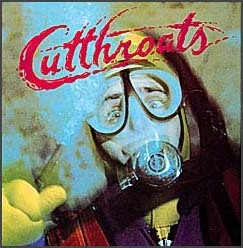 Ninety-five millichrons later, you'd emerged with a buzz-cut scalp and a permanent layer of de-licing spray covering your body. Also, there was a mop in your hand. You'd been commissioned Ensign 7th Class, Code KP8: licenced to swab. And since that day, the closest you've come to Deep Space heroism was scrubbing down the radioactive leper colony on Ishmael-3. But suppose that jumbo fortune cookie you got at Qwang's Take-out Asteroid last shore leave was right, and your luck does take a turn for the better. Mayby you will indeed narrowly escape disaster. 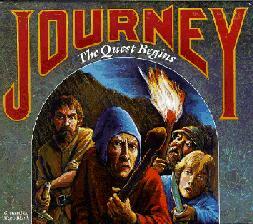 Perhaps you really are about to take an unexpected journey, and meet a short, mysterious stranger. 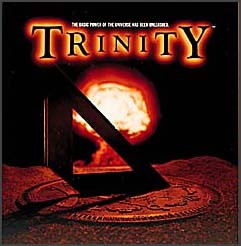 It's even possible that you'll actually travel to an unknown corner of the universe, where you'll save a doomed planet - or die in the attempt. In fact, we'll guarantee it - every last crumb of it. Because that's just the way the cookie crumbles, here in the next dimension. Type: Text only Written 1983 by Michael Berlyn and Patricia Fogleman. There's an old Egyptian fable that tells how a sacrilegious camel once dined on a high priest's pocketwatch, only to awake in the morning with a bellyful of ticks. The moral, needless to say, is that one should never bite off more than one can can stomach. Evidently, you failed to heed this wisdom - else why would you, a small-time explorer, dare to brave the smouldering heart of the Egyptian Desert in search of a greaat lost pyramid? Now, too lats, you suspect that your boldness has been your undoing, for at this very moment you find yourself marooned by your followers, pursued by the vultures of death, and sustained only by the faint hope that you can somehow survive to reach the pyramid - where the skullduggery, pitfalls, and cliffhanging adventures will really begin. What indomitable inner resource is it that drives you ever onward against such desperate odds? Pride? Unflinching devotion to the cause of archaeological science? Or could it possibly be the prospect that the treasures concealed within the tomb are worth enough on the open market to keep you rolling in filthy lucre for the rest of your born days? 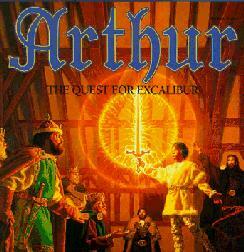 We leave the question open, with this footnote: Your quest transcends mere fortune. Here, amid the shifting sands of eternity, dignity and self-esteem are at stake. 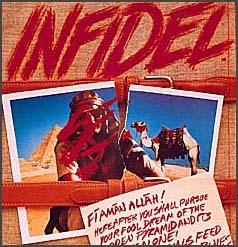 For you are branded INFIDEL. Type: Text only Written 1984 by Stu Galley and Jim Lawrence. There's something down there, something terrifying. Now you've got to face it... because now only you can save the Aquadome - the world's first undersea research station. The alarm sounds and your submarine, the Scimitar, stands waiting. 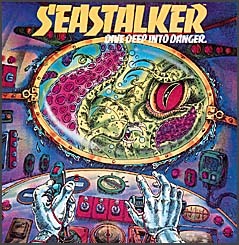 But not so fast - you haven't even tested the Scimitar in deep water, and the crew at the Aquadome may have a traitor in its ranks. So be careful! You have terrifying possibilities to consider, mysteries to unravel, life-and-death decisions to make. Success won't come easily. It may not come at all - because if you challence the deep without all your wits, you just might wind up as shark bait. Type: Text only Written 1984 by Michael Berlyn and Jerry Wolper. 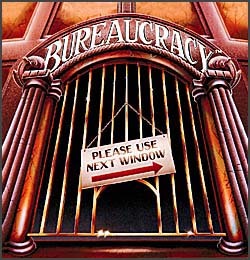 Type: Text only Written 1984 by Douglas Adams and Steve Meretzky. Type: Text only Written 1984 by Dave Lebling. Type: Text only Written 1985 by Brian Moriarty. Type: Text only Written 1985 by Steve Meretzky. 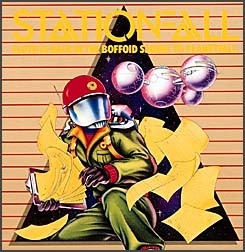 Type: Text only Written 1985 by Jeff O'Neill. Type: Text only Written 1986 by Brian Moriarty. Type: Text only Written 1986 by Steve Meretzky. Type: Text only Written 1986 by Stu Galley and Jim Lawrence. Type: Text only Written 1986 by Dave Anderson and Liz Cyr-Jones. 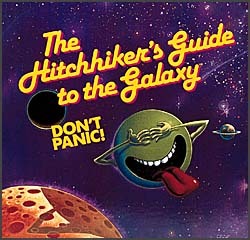 Type: Text only Written 1987 by Douglas Adams et al. Type: Text only Written 1987 by Steve Meretzky. Type: Text only/Sound Written 1987 by Dave Lebling. 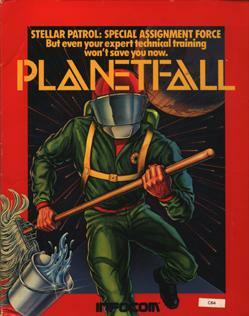 Type: Text only Written 1987 by Jeff O'Neill. Type: Text only Written 1987 by Amy Briggs. Type: Text only Written 1987 by Marc Blank. Type: Text only/Sound Written 1987 by Bob Bates. Type: Bitmap graphics Written 1989 by Dave Lebling. 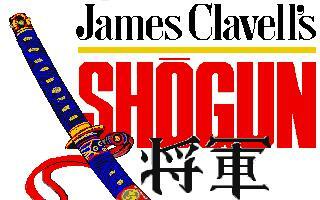 Notes: Based on the book of the same name by James Clavell. Type: Bitmap graphics Written 1989 by Marc Blank. 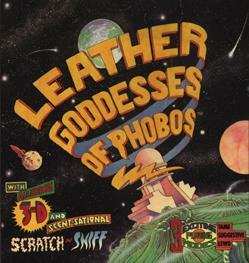 Type: Bitmap graphics Written 1989 by Bob Bates and Duane Beck.